Goalkeeper Marek Stech will get some valuable match practice for the Hatters' development side as they face Southend United U23s in the Central League this afternoon. 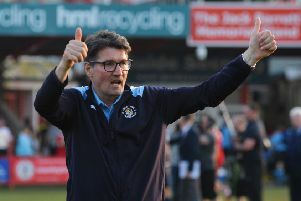 Hatters: Marek Stech, Jack James, Avan Jones, Adam Wedd, Toby Byron, Jake Peck, Drew Richardson, Josh Boorn, Josh Neufville, Connor Tomlinson, Jonas Kalonda. Subs: Tiernan Parker, Sam Beckwith, Lewis Swindells. Southend: Smith, Howard, Clifford, Hyam, Mitchell-Nelson, Kiernan, Batlokwa, Bunn, Kelman, Wabo, Phillips. Subs: Kinali, Bexon, Pianim, Ba, Knock.